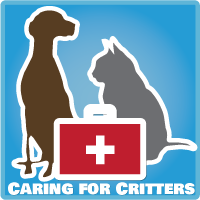 This post is part of the Caring For Critters Round Robin hosted by Jodi from Heart Like A Dog. Each day a different blogger will share a particular experience that their pet has had with a specific injury, illness, disease or condition and how they dealt with it. Please note that these experiences and treatments should not be taken as medical advice. We consulted with several veterinarians along our journey to get to the place we are today. Got it? Good. Now let’s get started. The topic I’ll be writing about today is Sherman’s torn ACL and our conservative approach to his healing. 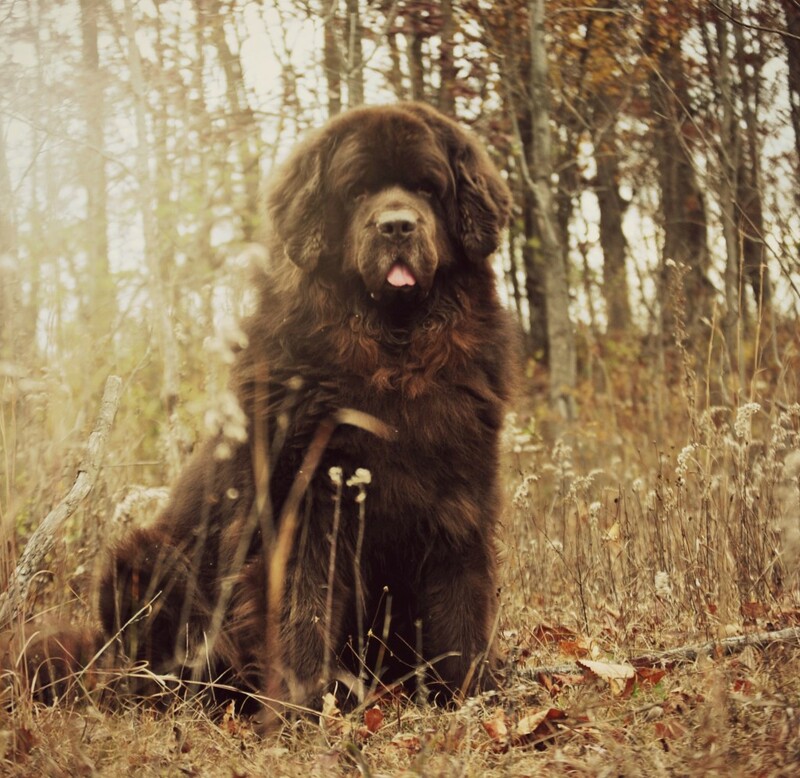 Sherman is an almost 8 year old intact male Newfoundland. He weighs about 140 pounds and I will never forget the day that he tore his right cruciate ligament. It was December 17, 2012 around 6:30am and my husband and I were just heading out the door with Leroy to go to a dog show. I let the dogs outside one more time to go potty. When Sherman walked out the door he was fine. When he walked back in he was not bearing any weight on his right rear leg and I knew right then and there that he tore his ACL. We headed off to the vet where confirmation was given, through the drawer test (manipulation of the knee and ligament) and x-rays, that Sherman had a full cruciate tear in his right knee. Sherman was given pain medication and the plan was to have his cruciate surgically repaired a few weeks later. The best laid schemes of mice and men often go awry part. The best laid schemes of dogs and Jen often go awry part. Unfortunately, 2 weeks after Sherman tore his ACL he got very sick and fluid had accumulated around his lungs which meant that surgery was not a safe option at this time. We never had a definite cause for the fluid and he was put on medications and very strict activity, which he was already on for the torn ACL but it was even more strict. His strict activity included not going up or down stairs so a ramp was built outside our home for him to go outside easily and effortlessly. Thankfully, Sherman made a full recovery from his pneumothorax after about a month but we decided to give his body a break for a little longer before his surgery to repair the cruciate. By this time Sherman was mostly weight bearing on his right rear leg but limping and we decided to do a course of Adequan injections, along with pain meds and joint supplements. Sherman responded very well to this treatment so after consulting with our regular vet and a holistic vet, we decided to give conservative treatment a try. This is where things got sticky because it is said that giant breed dogs often don’t do well with conservative treatment for this type of injury so we faced some criticism for our decision to pursue conservative treatment. This weighed heavily on me for quite some time but I stuck with my gut and moved on. Conservative treatment isn’t a walk in the park. It’s a lot of work and money. Sherman’s conservative treatment started with cold laser therapy, small leash walks, an herbal joint supplement, a regular joint supplement and pain meds. All was going very well until Sherman tore his meniscus in the same knee. We consulted with an orthopedic specialist and restricted activity followed for a few weeks and we moved on. Next we did a series of hydrotherpay for several months, increased our walks, switched joint supplements and used pain meds as needed. Sherman was progressing nicely and we increased walks, added in hill work-which involved going up and down small hills to increase his strength and keep up his muscle mass that he gained with the hydrotherapy and discontinued pain meds. The above has been our workout since, expect we have changed joint supplements several times before we settled on one that worked well for Sherman. Nearly 2 years later and Sherman is doing very well for a giant breed dog with a torn ACL. His left ACL is intact which is a huge relief. Sometimes he has a slight limp, but for the most part the limping is very minimal. A few weeks ago he actually did the kick thing with his back legs after he pooped and I was so shocked! It was a sight to see and something I haven’t seen him do in 2 years! He pooped kicked like he was 4! Yay!! Sherman currently takes Natural Stride joint supplement along with other natural supplements such as tumeric and green lipped mussel.. He hasn’t had any pain meds in almost a year and I couldn’t be happier with his results. Sherman did have to make some sacrifices in his life such as no more playing catch with his favorite football….well we still play catch……but Sherman has to sit there and catch the ball. It takes extreme accuracy by the person throwing the ball and it no longer involves running across the yard. I’m sure I’m forgetting some parts of Sherman’s story because it has been a long 2 years but I will tell you it hasn’t been easy and it hasn’t been cheap so if there are people out there that think that conservative management of an ACL tear in a dog is the easy way out…..you are very wrong. The Caring for Critters Round Robin has been taking place all month. Yesterday AJ from I Still Want More Puppies shared Bella’s journey with chronic kidney disease. You should check it out. Tomorrow Jan from Wag’nWoof Pets will be sharing her post. Been there! Only the tear was in MY right knee which surged was required (not fun), and I also have a cat that has a torn ACL, she is on conservative treatment as well. Apparently it’s not such a big deal in cats? But If her pain tolerance despite her combination joint and pain meds decreases then we’ll start talking other options. She’s six, and her ACL has been torn for two years now. Well done for sticking with your gut and doing what was right for your dog!! How does the cost of conservative therapy compare with the cost of surgery? Thank you for this article — it provides GREAT information. I have a friend who has a dog with a torn ACL, and this will be a wonderful resource for her. I’m so glad Sherman is doing so well. He obviously has an amazing team helping him! Sure hope he continues to do well. So many dogs have that ACL issue, we hope to never have to deal with it. Having to deal with a major injury like this is my biggest fear. But if you can do it, so can I. Thank you for sharing Sherman’s story in the Round Robin. I’m so glad that CM worked for you. We did try CM with Sampson, supplements, restricted walks, no running or jumping and it was working. We had scheduled his first hydrotherapy appointment when BAM he ran in the house and tore the damn thing. I think I really need to get a list of things Sherman is on for supplements as I’m paranoid now about Sampson tearing the other one! My Newfie, Porter, tore his ACL when he was 2 years old. He and our lab went into the woods, chasing a bunny, and he came back limping horribly. Vet confirmed it was torn. We were fortunate enough to find an awesome orthopedic surgeon, and opted for TPLO surgery. The recovery and rehab were grueling – crate bound for 4 weeks except to potty on a leash, and then slow short walks, slowly building to longer walks with hills. 6 months later, Porter tore the ACL in his other knee. Same surgery, same recovery and rehab. Thank goodness I was between jobs during this time, and could devote full time care to him. 5 years later, I can say he has no limp, he is on no meds, and we now live in Alaska, and he has no adverse reactions to the extreme cold. He is like a puppy, running in the deep snow each winter. Thank you for your story. I bet it was a long hard journey, I’m glad it is working for you and Sherman and that is is doing good. Thank you for the last statement about a conservative one being a easy way out isn’t. I would have to agree with that. Love that picture of Sherman! It is not fun to make decisions ie surgery v. non surgical treatment. Maybe Sherman getting fluid build up actually helped you make the decision since you had to wait it out. So glad he is doing better Jen. I’m sure it has been such a long hard 2 years, but I’m so glad that Sherman is doing OK. The Natural Stride is still working well for our golden and her arthritis as well. My Cocker blew out her ACL and tore her meniscus. The vet put her on pain meds and an antiinflammatory. Then he talked about doing bloodwork the next week in preparation for surgery at $3,800. plus! I read a lot on the Internet and decided I would give her 90 days to see how she was doing. We went back to the vet a week later and he’s almost salavating about doing surgery! I told him my decision and he said he has seen Cockers recover from this injury without surgery. She hurt herself at the end of Juky, and now, mid Sept she is off pain meds, off anti inflammatories, doing stairs and getting back up on the chairs and bed! We walk but not as far as we used to, but we will build up to our long walks again now that the weather is cooling down! My hopes and prayers are that he continues to improve. Such a long and scary road for you all to travel, but I think your post is inspiring to many. Thanks for sharing.